|Wrongdhonu| A Proper Freelancer Guidelines. Wrongdhonu - A Proper Freelancer Guidelines. Hay Day is an android and iOS platform supported game. You can increase your level and earn a lot of gold coin and product but you cannot sell or buy it to earn money. Today I share with you the secret Hay Day tricks to earn money from Hay Day. I play Hay Day since Six months. I play most of the time at a day and try to earn more Gold coin, Diamond and burn and silo equipments. So, I increase my level more quickly. You can buy diamond from the Hay Day team to use those diamonds to upgrade your burn and silo storage or productivity more quickly. But no ways to direct buy Hay Day gold coin. But I can give you the secret way to increase Gold coin. Normally you cannot earn money from Hay Day. But now be ready for listening the Secret way to earn money from Hay Day. 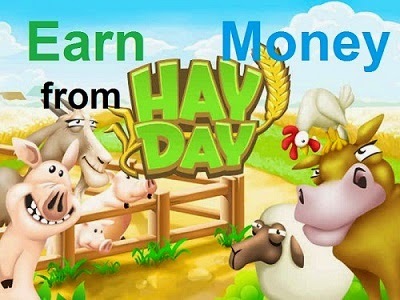 You can sell your Hay day products and equipments and can able to earn money. That’s way you need to create a hay Day Group that is called the neighborhood group. Then you can chat with your buyers and sell yours products to them and Take money. I describe all the process by one by one step. At first create a Hay day group. Which works as like a shop and you can arrange your shop with all hayday equipments and products. If your shop has more products, your earning grows more quickly. You must change your group setting to “confirm to Join”. Because then anyone can not directly join your group. Its help you to keep your Hay Day shop more secure. Then Storage a lot of products. If your shop has more products and equipments your shop become more popular. So collect more Burn and silo products. So, you need to upgrade your and burn and silo storage a High size. Then you need to marketing your shop by Facebook or twitter or such other social sites. If people do not know about your shop, How they go there. So, start marketing about your shop and business. When your business gets a popular marketing then you get a lot of buyers. Then you make a contacting way to your customers. You can use Facebook for it. Because when you add someone at Facebook he or she become as a friend at hay Day. So, then he or she directly buy from you. Or you can add them to your Hay Day group. Then make a contract with your customer and ready for the deal. You must tell him about your rate. And you must tell him who pay first. Because this is important to online business. And both parties do not know each other. So, it is better to take payment first. So, always be honest at your contract. You must select your payment method. Hay Day normally support many payment method at Google play store. But It is better for you to choice PayPal. Because you normally use small amount payment. For big payment you can use Master or Visa card. After making contract and all rate then transfer your products to your customer by 1 Gold coin per 10 Hay Day products. Please be honest at your business. So never make any problem after getting payment or getting products. After transferring your product then get your payment. Make sure they give your payment as a gift. That’s help you to avoid your all money transfer problem. So be careful about it. This is the way to earn money from hay Day. If you search for a trusted seller you can contract with me. I give you 20 Upgrade equipment at 1 Dollar and 25 Products at 1 Dollar and 1,00,000 Golden coin at 10 Dollar. So if you agree to the contract you can add me Facebook at www.fb.com/mostafizurfiroz please at first give me a message having Hayday Contract or otherwise I do not accept you. All of the tricks are that. This is my own Hay Day earning tricks. So, please do not share my tricks without permission. And if you have any question, please don’t be hesitated to comment here. I try to give solutions as soon as possible.